When you hire S&S National Waste, you hire an entire team trained to provide creative solutions for difficult projects. Our goal as a waste hauling company is to make your job easier and more cost efficient. By using our innovative system, we can help you stay on budget by allowing your laborers to work more efficiently. Click below to talk to one of our team members to learn how our grapple system can save you money! ​ We are the problem solvers and we work for you! Our custom made grapple trucks are designed to remove construction debris from any job site. Our grapple trucks can pick up to 10,000 lbs. at once and reach debris as far as 20 feet away. 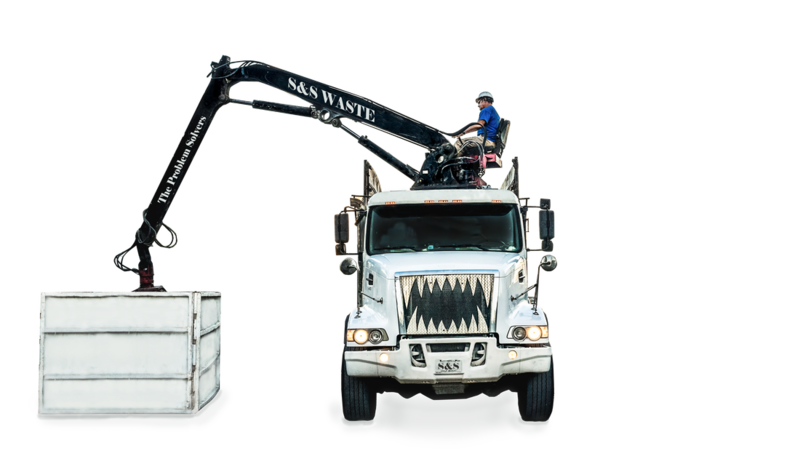 This means S&S National Waste is able to reach over fences or walls to empty out your dumpsters, or even remove a trash pile on your site with no trash can - something that would be impossible for a roll-off truck to accomplish. So no matter what debris you have, trash, concrete, dirt, rocks or vegetation, our grapple trucks are fully equipped and designed to handle all of your construction debris removal needs! We are the inventors of the Grapple Service for removing construction debris "
in-between. Our grapple trucks can empty multiple dumpsters in one trip - and like a quick breeze, we are in and out - the only thing you'll notice is a clean dumpster. Need your EXISTING trash pile picked up? NO PROBLEM, WE’LL TAKE CARE OF THAT TOO! ​If having a container on your site isn’t feasible, or if you need an existing debris removed, don’t worry, we’ll take care of that for you, too. We can even pick up the piles that never made it to the container, so you do not have to deal with the hassle of taking your laborer's time to remove construction debris. Let us take out the trash, because the only thing you can't recycle is your laborer's wasted time. Our goal is to solve your waste problems, so you can focus on developing your project, and not waste time on picking up trash. ​We are the problem solvers and we work for you!